Tracey has been dealing in Real Estate and has been a top producer in Oxford County since 2006 with the Century 21 organization. In 2016, Tracey formed The Sherman Group to maintain the high level of customer service her clients were accustomed to and deserved. In 2017, The Sherman Group received the centurion award, the highest award offered by the Century 21 organization. In 2016 Tracey was the #4 salesperson in her company & in 2015 Tracey was the #3 salesperson in her company winning Diamond award status both years. Tracey is passionate, experienced and a top negotiator. Her experience makes sure her clients never have anything to worry about. Tracey is a great supporter of local charities, big and small. She is proud to be a Woodstonian, knows this area well and is excited to help you buy or sell in Oxford County. After a decade as a partner in a successful printing company, Marshall decided on embark on a career in real estate. He joined Century 21 Heritage House Ltd. alongside Tracey and put his lifelong love of Oxford County as well as his extensive business experience to work for his clients. Marshall is honest and highly protective of his clients needs. He is also a skilled negotiator. Marshall worries about all of the details of buying or selling a home, big or small, so his clients can just enjoy the experience. As a member of The Sherman Group, Marshall received the Centurion Award in 2017. This is the highest award offered by the Century 21 organization. Marshall earned his diploma in graphic design from George Brown college and brings those skills to task when marketing homes. He looks forward to sharing his knowledge and making your move the smooth transaction it should be. Marilou started at Century 21 Heritage House Ltd. in 1989 as an administrator, and transitioned into sales in 1997. Having had a real estate partner for eighteen years, she is thrilled to be a member of this team and they are thrilled to have her. As a mother of one, stepmother of three, and grandmother of eight, she is comfortable working with all age groups. Having experience with builders, Marilou can walk you through all the steps of new construction. Whether looking for your first home, a home to accommodate a growing family, or downsizing to a more comfortable lifestyle, Marilou would be honoured to help you Make Your Next Move! Mike began his real estate career in 2013 in his hometown of Peterborough. Prior to real estate Mike worked in the auto industry and brings strong problem solving skills, work ethic and dedication to his real estate career. Lucky for us, Mike decided to make a move in 2015 to Woodstock with his daughter, Teagan and joined the Century 21 Heritage House office. Mike is an experienced realtor and is a great asset to The Sherman Group. Mike understands what it’s like to relocate. Whether you’re moving into our area, over two streets, upsizing or downsizing, Mike is patient, honest and prides himself on providing superior customer service. Mike is a graduate of Fleming College where he earned his marketing diploma. Amelia always had a love for home decor and interiors at a young age. You could often find her rearranging her childhood home and quickly found a love for interior design. 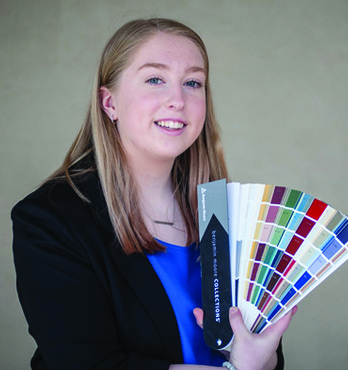 Eager to fulfill her passion, she attended the Interior Decoration program offered at Humber College. Today, she is a certified Interior Decorator with an innate desire to create and design interiors that exceed clients’ expectations. With an eye for detail, a superior sense of style, and a client-centred approach to business, Amelia Reynolds has proven herself as an innovative decorator. A Full Time Team whose members are available 7 days a week. You have a busy schedule and they understand that. They will work around your needs and make sure that they are available when you need them. The best homes sell quickly! You can't afford a realtor who can't answer their phone or get away from their day job. They will strategically market and showcase your home which will lead to high visibility and heightened interest from buyers. The end result is selling your home quickly while attaining the highest price for your home! Professionally designed marketing materials. Everything from conventional newspaper advertising to gorgeous custom listing brochures and original listing videos for Facebook and other social media sites, nothing is stock. Their marketing will assure your home is seen by more potential buyers in multiple locations. Professional photography. They capture your home and its essence and make it look its very best. Great pictures truly are worth a thousand words! Home staging offered as required. Property management service offered to property investors. They utilize all facets of social media — Buyers can't purchase what they are unaware of. Facebook, Twitter, Instagram and Kijiji - this is how most of today's buyers are finding homes. Custom website featuring your listing. The Sherman Group won't get lost in the crowd of generic websites, and neither will your home. Concierge service. Their service doesn't end with the sold sign on the front lawn. They will always be there to help or answer questions and make sure you are looked after. Knowledge and experience. Tracey has been a top producer for over a decade. The Sherman Group was recently awarded a Team Centurion Award from Century 21 Canada. This award is one of the most prestigious awards given by the company. They have years of negotiating experience to put to work for you. Marshall joined Tracey a few years ago bringing his wealth of experience in owning his own company for several years to the team. We couldn’t have asked for better real estate agents! They helped us decide what upgrades were worth it in order to sell our home (and it was way less than we thought! ), were super responsive when we had questions, and helped us find a great home to move into. They had our house sold within a week of listing and helped us secure our dream home by being on top of things and fighting for us. We will definitely use the Sherman team again when we move next!